Yay! We have two winners: Bhavna knew that he is Shetty, and Anonymous UK that he was a stunt/fight coordinator for films in addition to being a bad guy. Posted on December 19, 2007 at 3:37 pm in Hindi movies, Trivia time	| RSS feed You can skip to the end and leave a reply. Pssst… Beth… who is he? That’s half the answer right! It is Shetty. Besides acting, what else did he do in movies? M.B. Shetty is a stunt coordinator. According to the information I got, is he related to Sunil Shetty. Its the father of Sunil or the uncle. 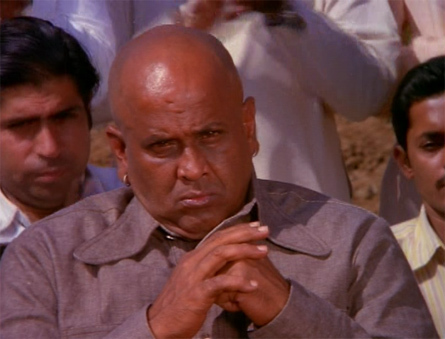 He was also the training instructor of Dharmendra. That’s why he appeared as one of the baddies in several of his movies. Yakeen, Seeta Aur Geeta, Yaadon Ki Baaraat, Shalimar, etc., are a few such films. One more thing about him. Did anyone notice that in the movie, he faints or dies only after the actor hits or punches him on his head.